This essay is taken from a note that I posted on FaceBook about Darren Aronofsky's recent film, Black Swan. It does not contain spoilers. The films that I have always found most compelling are those that present an intriguing character, one with whom identification is a difficult, but a rewarding, struggle, and send that character off on a journey of personal discovery. Their appeal, in part, has to do with the fact that the hero's quest for transcendence or, as is often the case, redemption suggests the possibility of our own transformation. They offer us a distorted but beguiling mirror in which the hero's hopes and fears and doubts become our own. Darren Aonofsky's film, Black Swan, succeeds wonderfully as such a film. The Aronofsky films I have seen - Pi, The Fountain, The Wrestler and now Swan - invite us to enter personally uncharted territory and there to step into the shoes - or slippers, as the case may be - of, respectively, an unhinged mathematician, a disillusioned conquistador, a dissipated professional wrestler and a psychologically scarred aspiring prima ballerina. It is a testimony to the director's skill and his uncanny selection of players, that we quickly begin to identify with these lost souls, in spite of the fact that their lives and their occupations are entirely foreign to us - an accomplishment all the more remarkable in a movie industry that relies on cookie-cutter characters and characterizations for commercial success. In each of these works Aronofsky dispatches his reluctant hero on a quest, an attempt both to come to terms with a damaging personal history and to transcend the past by reconciling the demands of art or profession or craft with the reality of the world as it is. For Swan, this journey of transcendence is rooted in a universal artistic challenge, how to move beyond the technical mastery of a medium and take the risk involved in opening oneself up to messy and often unwelcome psychic forces that are the heart of profound artistic expression. On one level the film is the story of Nina Sayers (Natalie Portman), a beautiful and talented young ballerina who is poised to become the principal dancer of an unnamed New York company, and must overcome her slavish good-girl commitment to mechanical virtuosity and tap into dangerous emotional currents that emanate from her unexplored sexuality and a toxic relationship with a controlling, ever-watchful mother (played magnificently by Barbara Hershey). On another level, Swan is a tale of the director's own struggle to put his mastery of the medium of film in service to the telling stories that are not only exquisitely crafted, but also emotionally compelling. Aronofsky's abundant skills are on display as he demonstrates a cinematic range that encompasses both the glossy presentation of lavishly staged ballet as well as the gritty exposition of the intimate details of Nina's personal ordeals. In doing this Aronofsky reminds us that for him the life of genius - and not only artistic genius - is a ongoing flirtation with insanity, a ceaseless effort to locate and occupy the razor's edge that is the wellspring of creativity. Finally, Swan is a mirror of Natalie Portman's own trajectory as an actor. Poised, as her character Nina is, at a juncture in her career where accomplishment beyond mere technical excellence beckons, Portman has dared to take on a very different role, one that demands that she expose herself, both emotionally and sexually, in order to discover her true potential. This actress is determined to put away childish things - like so many stuffed animals tossed down a trash chute - and declare herself as a performer who can draw on both the light and the dark aspects of her nature. 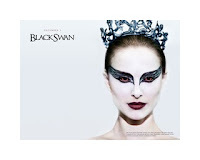 So Black Swan is all of these, a story about a troubled young ballerina, a story about its director, Aronofsky, and a story about its star, Portman. It is a hall of mirrors, which teases and disorients us by confusing the real world with the imagined. Perhaps most importantly, it is a hall of mirrors in which we are invited - every now and then - to catch a glimpse of ourselves. In this regard, in a small way, it is also a story about us. Black Swan - Mirror, Mirror by Marc Merlin is licensed under a Creative Commons Attribution-NonCommercial-NoDerivs 3.0 Unported License.